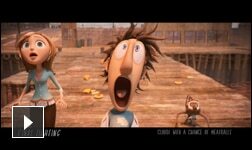 Inspired by a popular children’s book written more than 30 years ago, Sony Pictures Animation used the latest in digital animation technology to create Cloudy With a Chance of Meatballs, an imaginative 3D comedy. Rather than model the entire hamburger as a single piece, the team decided to model each ingredient separately and bind them together using a Rigid Body Dynamics (RBD) system. 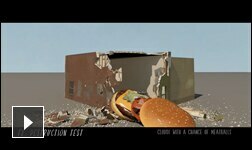 A Soft Body Collision extension of RBD enabled them to visualize the burgers bouncing and breaking apart. Sony’s digital department collaborated closely with the art department to create rich environments and heighten narrative impact through rigorous attention to texture, color, and light. Numerous layers of digital effects contributed to the avalanche of action in the bread boat sequence. A modified RBD system enabled the animation of thousands of pieces of food, sparing the team the laborious task of animating each by hand. Sony’s proprietary destruction system was used to break up the buildings and add debris. 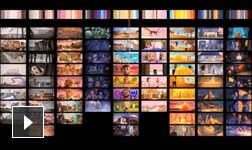 A dynamic color language was created by the visual development team at the onset of production to establish a distinct visual mood for each scene. Here, the top image shows the color script and associated scenes, while the bottom image shows the final film renders.